"The Codex Germania unearths the mythological realms of the ancient Germans. From the murky forests of their beginnings rise the myths, the magic, gods, goddesses, monsters, heroes and legends of the ancient Germans, all brought to life for your Castles & Crusades game." 'This chapter serves a twofold purpose in telling history. First, it will give a brief overview of early Germanic history in Europe, giving beginners in this field of study a basic understanding. the furthest south (Roman Empire and Spain) to Britannia to the west, Scandza to the North and the Black Sea to the east. game play. Germania, on the far side of the Rhine, was seen in Roman eyes as Germani Liberia (Free Germania) where the many tribes there were not under imperial control. Mythical places in the Germanic Otherworld will also be describedas best as information can be gathered from the limited sources. Key locations in Germania and other settled (and invaded) regions by Germanic tribes are detailed here for places that CKs can use in their games. The mythical locations in the Codex Nordica can be used to enhance those listed here by the CK." Magna or ‘Great Germania’, but this was cut short after the fatal Battle of Teutoburg Forest in 9 C.E. This magical world exists outside of the reach of Middangeard normally and is bound tightly to the tree of Irminsul, as it is filled with its constant magical energies. The elves that live here are whimsical and frivolous acting among each other, but they turn sinister and devious towards strangers (specifically humans) if they are interrupted. Fair beings, standing both short and tall, the ælf-kind are purely composed of magic. Their world is a large, wild forest-land filled with other magical beings and creatures that can be called faery. These ælves can glow with a white light from within in a heavenly manner if needed to banish away evil or dark beings keepingthis world untainted by the presence of darkness. forge. Wēland’s crafts have been sought after by many across the worlds, and they have attempted many deceptive plots to do so. To outsiders, the myriad rulers of Ælfhám will appear lofty and arrogant in manner, but this is due to the immortals’ difference from mortals, and the possession of their great magic. The land is largely untamed and filled with wondrous sights and beings beyond all comparison (CK can refer to the Codex Celtarum for faery abilities and extra beings not in this particular codex). allow mortals to meddle in their business. Mortals are looked down upon by the ælf-kind for their crudeness, vulgarity, and lack of refinement. These are the Elves I grew up hearing & reading about with my German neighbors in my home town. Yes they have some of the qualities of the Tolkein Elves but these are the origins & their every bit as alien & weird. The realms of Fairy & the Germanic gods are not to be treated upon by mankind. The monster section folds neatly within the mythological places & realms of the gods starting with alp is a type of elf vampire & then finally ending with the Germanic dragons which we get solid guide line rules ala Beowulf. The Germanic dragons are nasty pieces of work & this might happen to your PC's. Not artwork from the book but these are the type of monsters in 'The Codex Germania' . will outline a system that is closer to those mentioned previously." Yes I'm skipping over the ring oaths because there's a ton of background with these which are for adventures & I'll go into this later. This chapter is very well done in my opinion & really sets 'The Codex Germania' apart in its approach to handling the whole of Germanic mythological magick in Castles & Crusades. And this brings me to Serve the Gods which really dives deeply into the Germanic Pagan & Druidic traditions. It dives deeply into the Germanic mythological pantheon from the creator gods to the gods of warfare to hearth & home. Sacred groves & funeral practices actually get a solid style of use for Pagan cleric PC classes here. Chapter six 'Skilled in Battlecraft' gives the PC martial classes something to use in the Germanic mythological world. We get more pseudo historical information on the Germanic warrior, further details of the ring oaths of a warrior, & more useful information on the martial affairs of Germanic warriors, soldiers, etc. Including historical information on women warriors of Germany. Deadly rules for ancient artillery & arrows along with the shield wall. Property, land, blood money, and more all used in ancient warfare in Germany. Then finally two new PC classes The Dragonslayer & the Wod or Germanic 'Fury' which is similar to Norse beserker but they have some of their own mythic or divine wrinkles. Both classes are very well done. The slayer & witch classes from the magic section are excellent foils for both of these classes & I can see using all of this to put together an adventuring party for ancient Germany. Finally we get to the Castle Keeper's information about ancient Germany, its rulers, & society. This is a very well laid out chapter & has critical information about the whole of running a campaign. Again its very well put together. 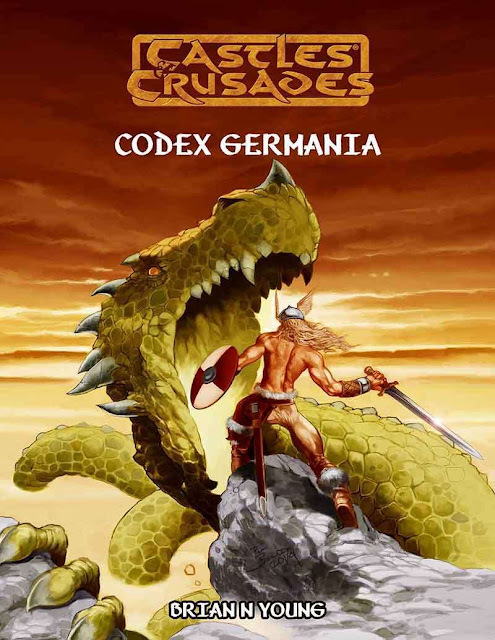 'The Codex Germania' is a solid & well put together product. I like how accessible it is & how well put together all of the information is in this book. I think that the 'The Codex Germania' is a solid five out of five. Now for the Amazing Adventures! 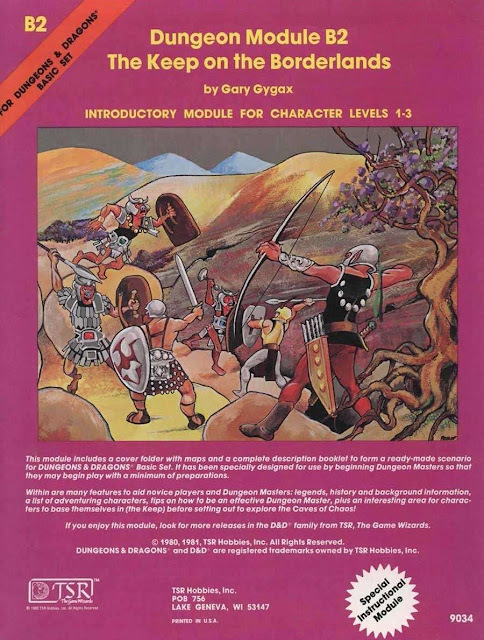 rpg dungeon master this is another in my mind essential book. Why?! Because of the fact that there is so much to pillage & use. 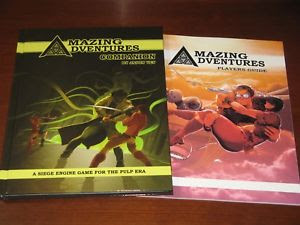 The Wod, the Dragon slayer, the slayer class,the witch, & more make excellent foils for the Pulp adventuring of AA! 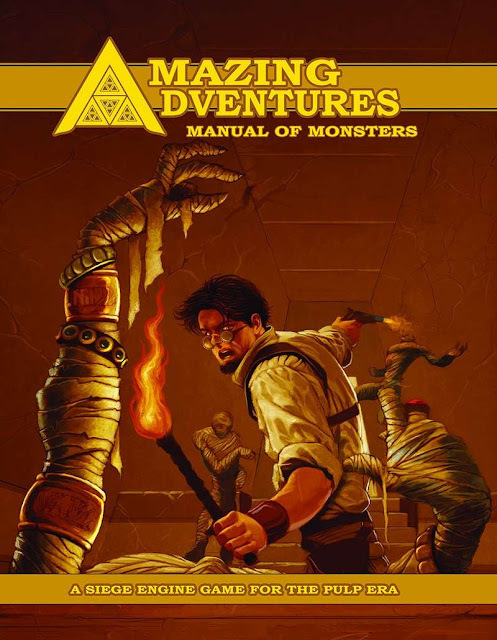 But once again this is a solid case of using the Amazing Adventures companion & the Amazing Adventures Manual of Monsters especially because of the Dragon Slayer class. The dragons & NPC witches of 'The Codex Germania' are solid evil & make excellent vile villains. They have motives, personalities, & out and out agendas that should they find their way to civilization would wreck havoc. The Monsterous Manual has a wide array of minor dragonic monsters that could also wreck havoc with the world of ancient Germany. The Wod could be used as the basis for a nasty PC class of fighter or adventurer. The use of 'The Codex Germania' for a World War two game is both intriguing & beyond the scope of one blog review & yes I will go into this more as my Amazing Adventures campaign continues! Halloween is fast approaching but any dungeon master worth their salt knows that October is Sword & Sorcery game time. The winds have been howling here at Casa De Fabiaschi & I've had tons of yard work as well as an enormous amount of sewing machine repair work heaped upon me. Jeffery Talanian posted on G+ & a wide variety of social media that we'd be seeing a brand new Astonishing Swordsmen & Sorcerers of Hyperborea Kickstarter. On Halloween with a wide array of brand new brand expanding products. This kickstarter is very important for fans of Astonishing Swordsmen & Sorcerers of Hyperborea second edition & first edition for that matter. Hyperborea began to change with the second set of AS&SH OSR adventures with The FORGOTTEN FANE of the COILED GODDESS. This was at the same time Beneath The Comet came out & Ghost Ship of the Desert Dunes. All of these adventures ushered in the second edition kickstarter & material. "Rats in the Walls and Other Perils also will include two more short adventures: Chainsaw’s “The Brazen Bull”, and “The Lamia’s Heart”, by Jeffrey P. Talanian. (An early draft of the latter was published in the AFS fanzine.) Edited by David Prata, all three adventures are set in the dismal City-State of Khromarium and designed for from four to six characters of 1st or 2nd level. Like our popular adventure module The Anthropophagi of Xambaala™, we think you will find this to be a great AS&SH campaign starter. It contains just enough mystery and danger to whet the appetites of your players, introducing them to the weird world of sword-and-sorcery role-playing in the City-State of Khromarium. “The Lamia’s Heart”: Your party are contracted by the nascent master of an unsanctioned thieves’ guild. To earn his favour, you must steal a singular gem from the mansion of a prominent merchant. Purloining this gem, however, may raise the ire of the city’s official thieves’ guild; notwithstanding, the reward is significant." are both perfect beginning points for an AS&SH campaign. 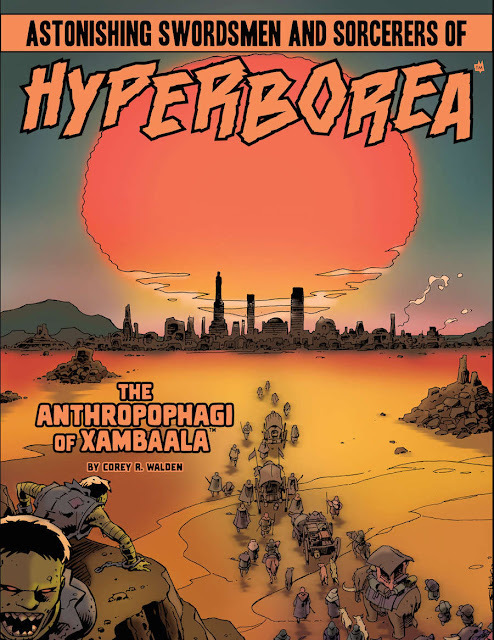 The Anthropophagi of Xambaala does an exceptional job f setting up the PC's at the cross roads of Hyperborea whist giving them an actual viable adventure location to spring board into more campaign action. The adventure setting within this module has lots of potential to help get old school players on board with AS&SH. The fact is that I keep seeing a bunch of lost Greyhawk or old school adventurers crossing the desert heat & ending up stranded on Hyperborea. The events of The Anthropophagi of Xambaala unfold around them. This gets the characters spring boarded into the world of Hyperborea whist giving the DM the opportunity to mix together two solid groups of adventurers. It could also act as a further opportunity to build a connection between the worlds. This give the players a few options to use existing characters to help build campaign cohesion. There are some solid campaign in roads that the Rats In The Walls adventures has to link up with the events of The Anthropophagi of Xambaala . This is especially true of the adventure “The Lamia’s Heart” which is inspired by Robert Howard & Clark Ashton Smith. PC's are going to have to be careful not to run afoul of the most dangerous elements of Hyperborea within these adventures. Make no mistake your PC's could end up not only on the menu but on the ingrediants table of some Hyperborean wizard. Happy Halloween folks & go here to help support the latest AS&SH kickstarter! "A temple destroyed by divine wrath... An ancient, imprisoned evil and a powerful idol. Mysteries abound in the tombs below the temple of the Iron God, protector of the dead. Discover the dreadful fate of the Iron God's priesthood and the reasons behind their downfall in this intriguing adventure designed for low-level characters. Tomb of the Iron God covers a large catacomb area on two levels, with 58 keyed locations and six new monsters. This is a Swords & Wizardry (0e) dungeon crawl for four to five characters of 1st or 2nd level, by ENNIE-award winning author Matt Finch"
October is Halloween for the kids but many of us OSR guys we know that's the prelude to the Sword & Sorcery OSR campaign time during the long Winter months. With the Astonishing Swordsmen & Sorcerers of Hyperborea mega Kickstater going off,"New Kickstarter campaign launching on Halloween! 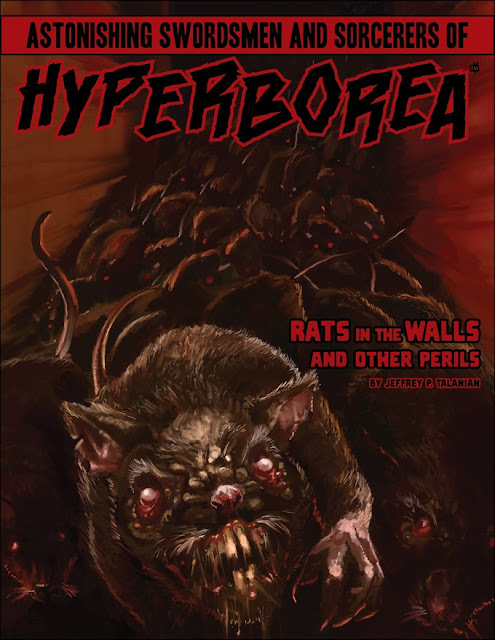 Four new products for Astonishing Swordsmen & Sorcerers of Hyperborea; Hyperborea Players' Manual, Hyperborea Player Character Folder, Hyperborea Referee's Screen, Rats in the Walls and Other Peril". Jeffrey Talanian let the cat slip out of the bag about twenty hours ago on G+ & other social media. What does this have to do with the O edition version of Tomb of the Iron God for Swords & Wizardry?! Quite bit actually. First of all I had three tons of messages & what not about the fact of why hadn't there been any announcement about The World of Jordoba?! Matt Finch was streaming actual play episodes on Youtube & Twitch. . Go here for the YouTube Playlist of the series. On the very night the high priest died of starvation, the Iron God visited a terrible vengeance upon these disloyal servitors. conscious but trapped in their almost-immobile bodies for all eternity. The subterranean catacombs under the temple still remain, filled with the treasures accumulated by the avaricious monks. The god, also, remains living within his great Idol in the Sacred Catacombs where he guards the dead entrusted to him. One other being remains as well, an immortal evil imprisoned a thousand years ago by the god himself - the Eater of the Dead." Everything in this adventure pairs the PC's against the forces of the Iron Priests & the monsters of the tomb. Factions & monsters that we heard about in the World of Jordoba Player's Guide. Here the rumors & threads of the player's guide come together in the form of the ruins of the tomb. Necroamancers are going to have a bad time at the tomb. Even though this is a first level PC dungeon its a really nasty one & very dangerous. The adventure contains lots of new elements specifically for Tomb of the Iron God for Swords & Wizardry. Why is this important?! Because they're keyed for this adventure but they have been adapted into the world of Jordoba setting. This places them squarely at the feet of the dungeon master to use elsewhere. Yesterday I mentioned that the world of Jordoba was like dimensional cheese cloth & rotting from within its own universe falling into the multiveral planar void. 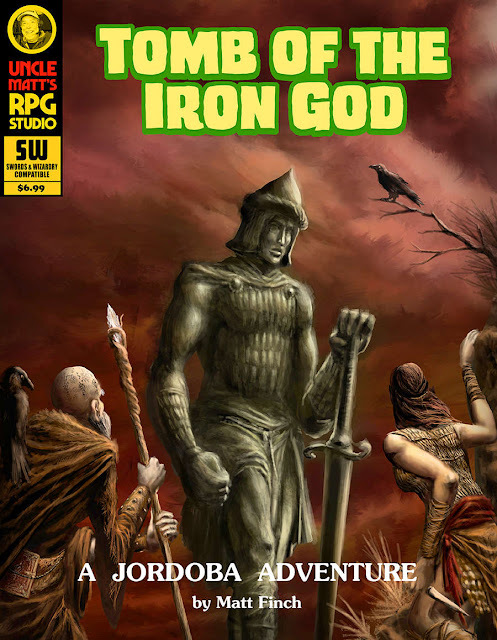 This means that The Tomb of the Iron God can be upon Jordoba while at the same time appearing in Greyhawk or Blackmoor. Imagine walking into one world for the dungeon & crossing the dimensional threshold unto another universe entirely. 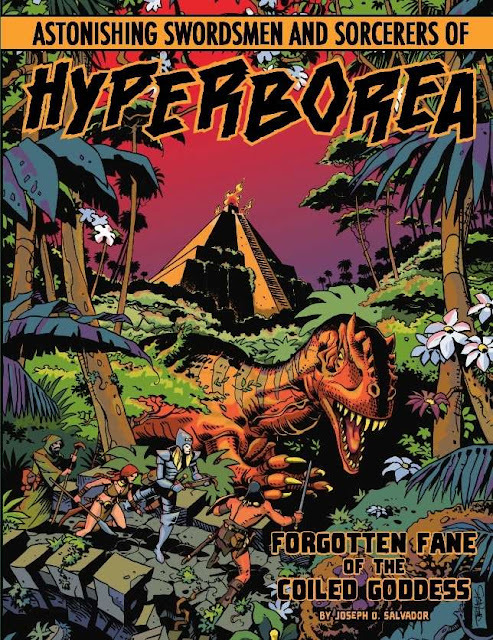 Walk across Jordoba & you might end up upon Astonishing Swordsmen & Sorcerers of Hyperborea's Hyperborean setting. "The World of Jordoba is the masterpiece swords & sorcery campaign setting written by ENNIE award-winning author Matt Finch. Jordoba is an ancient world populated by strange peoples and stranger monsters, physically fraying into the depths of the oceanic multiverse. Ruination has spread across the world, and the civilizations of the Sea of Khoramandu are pushed back to the very coasts. And yet, humankind has risen from worse threats in the past eons of its existence. Scattered villages remain in the wildlands, and new barons carve out freeholds in the wilderness, their names scribed upon new maps. Great wizards make sorties into the very shadows beyond reality, seeking forgotten lore and undiscovered frontiers of arcane scholarship. It is a world where unnatural things survive from ancient times, where nameless gods have turned their unfathomable intentions, and where even civilized regions must literally be re-explored. This is … the Weirdling world of Jordoba!" 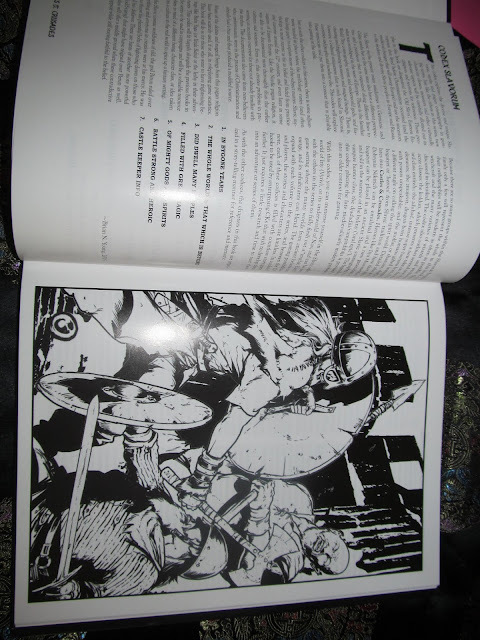 So once again I return to my first OSR love Sword & Sorcery with Matt Finch's World of Jordoba Player Guide which is done in the style of Seventies Marvel Conan or Sword & Sorcery comic book. This puts the reader in the product's mind set & campaign setting. lie awake of nights,knowing that civilization may be in its last days! this, even into realms of shadow that lie behind the reality we see. Our world is parting at the seams,companion. The oracles know it. The great mages know it. Astrologers chart a path of ruin in the skies, and the wolves sing their triumph to the five moons. forward in the world, forces and destinies begin to coalesce around you." From here the World of Jordoba Player Guide setting book jumps into religion, city states, numerous locations, the gods, astrological information, etc.. The whole book feels like Matt Finch's campaign setting notes & that's not a bad thing. What your getting is a thumbnail setting done right. That is to say a whole campaign world in fifty pages that you can make your own. 'where' & 'when' they want it. That's significant because it takes the pressure off of the dungeon master from ruining the flow of home brew campaign that's already in action. The cartography is by Glynn Seal, the cover artwork by Adrian Landeros & the whole Sword & Sorcery affair has Matt Finch's writing & design all over it. "Jorboda is physically fraying into the depths of the oceanic multiverse. Ruination has spread across the world, and the civilizations of the Sea of Khoramandu are pushed back to the very coasts"
is solidly done & crams lots of ideas into fifty pages that many other OSR adventure settings take a very long time to do. So for example if a dungeon master wanted to run the classic Keep on the Borderlands in this setting. The keep & all of its kit could be a short ride away. 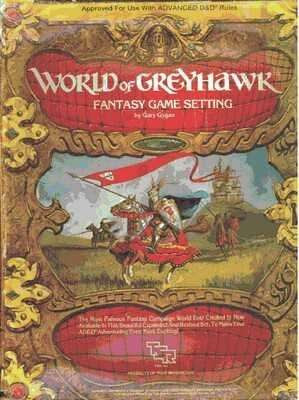 The idea of keeping Greyhawk intact & allowing the PC's to cross into another campaign setting makes this a brilliant adventure addition. 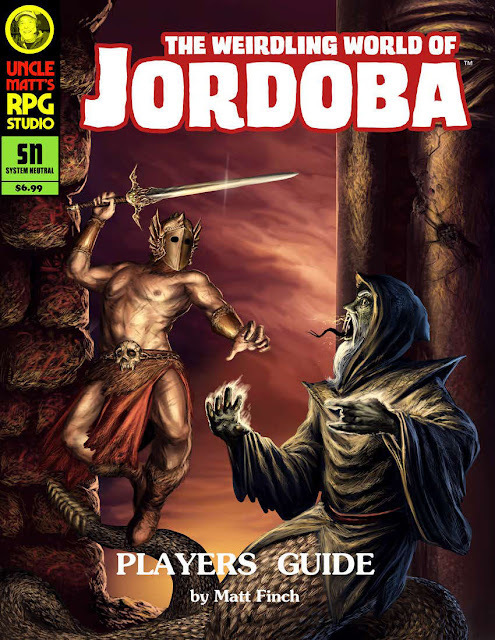 I can see using the World of Jordoba with other OSR game settings such as Astonishing Swordsmen & Sorcerers of Hyperborea. The planar rifts & feel of the campaign setting allows parties to make the cross over easily. The fact a myriad of OSR systems could be used to run the Jordora make this a prime candidate for Lamentations of the Flame Princess. The idea of expeditions from a dark historical Europe into a decaying dimensional Sword & Sorcery hellhole has all kinds of appeal as an adventure campaign. Are there certain things that I'd change about the World of Jordoba Player Guide? Yes right off the bat there's no print on demand option for Drivethrurpg. Secondly I'd love a large version of the map featured in the Player's Guide as a separate PDF and as another print on demand product. Now the reason why this is a concern is the fact that this product uses planar rifts as possible adventure & campaign hooks. Players love to have actual maps & physical products to interact with. All in all I was really impressed with the way that Matt Finch managed to pack so many original ideas into fifty pages. I think that the World of Jordoba Player Guide is worth your time & money. So Bruce Heard has been busy with the Calidar Wings of Darkness Kickstarter, but gasp the world of Calidar is D20!?! No this source book is actually system neutral & easy to adapt to the world's most popular role playing game. Bruce Heard really seems to have a winner on his hands here, this source book is going to be in the same style as some of his earlier efforts;"Along the same general idea, "On Wings of Darkness" blends a new skyship episode in a 132 pg. geographic Gazetteer packed with info about a realm of wizards and demons. The following chapters follow the introductory short story". "This Kickstarter's intent is to fund cover and layout artists, the illustrators, the project editor, and the cost of your rewards (print & postage.) Artist Brent Chumley committed to producing the cover artwork needed for this book. Steven Cummings, Joe Garcia, and Eric Lofgren will bring their talents to illustrate this gazetteer as much as our stretch goals will permit. Janet Deaver-Pack has staked her claim upon the project's editing, while Thorfinn Tait will pull all the pieces together, including new maps. Most of us have have worked together before on previous Calidar projects. Like all previous Calidar projects, "On Wings of Darkness" will be printed on demand via DrivethuRPG, which eliminates mass printing, warehousing, and retail distribution." So that's some of the real world background & the kickstarter material, if you want to really get on board the just hope over to the Kickstarter & pledge. But how are you going to incorporate 'On Wings of Darkness' into an on going campaign. I've been wracking my brains because this is a high fantasy setting. The answer came to me over lunch whist working my way through a ham sandwich. The answer of course is demons! 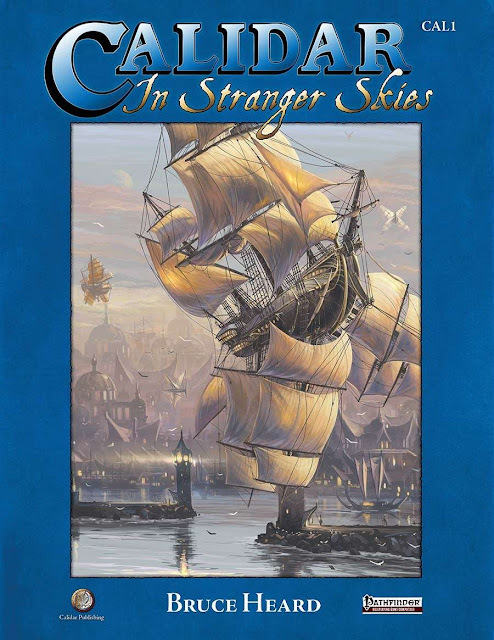 I own one Pathfinder book & its CAL1 Calidar In Stranger Skies. Even though this is a 'Pathfinder' book its in the same style as Bruce Heard's Princess Ark style but with a very nifty high fantasy setting. On Wings of Darkness is going to be using that same setting with a game system neutral mechanism. Calidar is a setting where demons are being used for many of the settings tasks & infrastructure. "Master & Servant: A nation where demons serve the spellcasting class, local laws, and tools of lordship are presented alongside a who's who of Caldwen's most notorious demons." Demons are not known to be easy to deal with at the best of times. A world where wizards are political & ethical rivals opens up all kinds of opportunities for the dungeon master. What if Calidar's plane/universe merges with other realities ala the worlds of Lord Dunsany. The sky ships of Calidar already have a Spelljammer/boxed set Champions of Mystara: Heroes of the Princess Ark (1993) feel. This hook puts Calidar into the realm of Clark Ashton Smith, Leigh Brackett, or perhaps some of the other efforts of Robert Howard. not only suggest that this is the case but expand out NPC captains in BCEMI D&D stats. "In the first of the articles intended to convert Star Phoenix crew members to D&D BECMI, I had detailed Captain Isledemer d’Alberran. Here’s the shyship’s first mate, Enna Daggart. She was first described in CAL1 “In Stranger Skies,” page 110, for Pathfinder. If you haven’t read the first article, click here for details, and familiarize yourself with Calidar’s peculiarities. Reminder: weapon damage listed here reflects the Weapons Mastery Table (Rules Cyclopedia, pg. 78-79)." If your not following Bruce Heard's blog then I strongly suggest you do. Much of the material for the setting of Calidar has appeared there. I've been following Calidar for sometime but there are not enough hours in the day to get all of this on the blog. Work has been taking great swaths of my time. What does all of this mean? It means that player's PC's might be running into the skyships of Calidar in a wide variety of ports & not all of those ports might be a part of the waking world of your current campaign. Reality in certain ports can be a bit fuzzy & highly dangerous so those attempting to make the crossing into the realms of dreams or the alien stars that shine down upon alien planes should remember how dangerous these journeys can be. "Norv & Galv crawled along the guttural entrance to the former Roman temple, its gods long replaced by something much worse. 'Did you bring the torches?! ', the voice quivered & it wasn't the rime cold or the slime under Galv's backside. Norv made his way to the ruin's gated remains which had been bent years before by something it hitting it from inside with great force. The candle light arched around the rusted remains & Norv held his hand up for silence. He took the ox oil from his pack & literally applied it but neither warrior saw the spent made from darkness as thick as a man's thigh crawl from right over their heads. The monster was another limb of the thing of darkness that lived in the ruins of the temple. The village chief would keep his half of the warriors bargain & his daughter. Norv's son would marry another & he would mourn his father. There were no time for screams & only the wet sucking sound of flesh then silence played in the aqueduct. 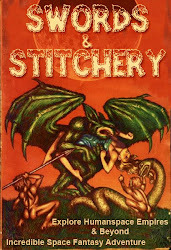 But this was the price to pay whist messing in the darkness in the affairs of wizards & demons. ."
There are a few OSR products & rpg products that use the Slav mythology & occult traditions as the basis for an rpg setting. The Codex Slavorum does exactly this & perhaps a bit more. Peter Bradley does a bang up job with his artwork. 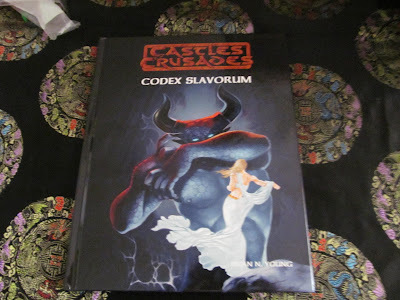 The Codex Slavorum we finally get the mix of the Slavic myths & the spiritual realms with D&D style elements even though its Castles & Crusades. Volkhv & their ilk finally get their due & its well done. Among these folk your not going to find any flashy fireball wielders unless you want to get burnt at the stake. This is set during the 'Time of Legends ' & folks like Oleg are important NPC's. The artwork(not in the book btw) below illustrates the importance of the occult world against the world of man. There are some dark reasons for this. 'The Codex Slavorum' presents the all too real struggle of light vs darkness with the Slavic shades of blood red & dark mythic gore. This is an epic book & tool kit. Most folks think of the world of Slavic mythology being the world dragons, liches,a myriad of ghosts, spirits, etc. but its really the world of the vampire. The vampire of 'The Codex Slavorum' is not a monster to be taken lightly at all. This is a force of undeath at its worst & there is a PC vampire hunter class here to counter it. I have to say that there must be more then a few very dead vampire hunters. 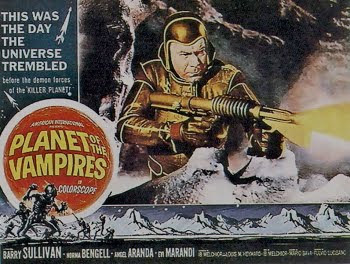 Sure they may be formidable but here the vampires are very dangerous indeed. These are the vampires of Slavic legend fueled by the gods of the underworld. Forget your cinematic vampires these are the horrors of legend & they make the vampires of "Flavenlost" look tame. The forces of darkness & horror are well represented in the ninety eight pages of the ' The Codex Slavorum'. But the forces of light have their due with Eagle Knights, heroes of legend, the gods, Pagan priests, hunters of the supernatural, & more are also within these pages. The Slavic world of ' The Codex Slavorum' is a complex & dangerous world intertwined with the gods as well as native legendary knights. 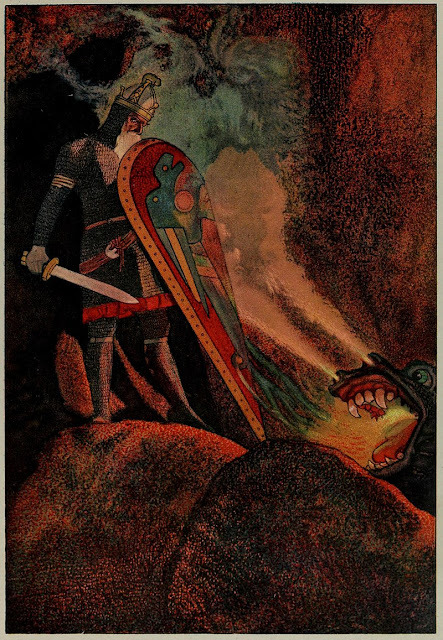 Mythic knights whose stories are as complex as any of the legends of Arthur & his band. 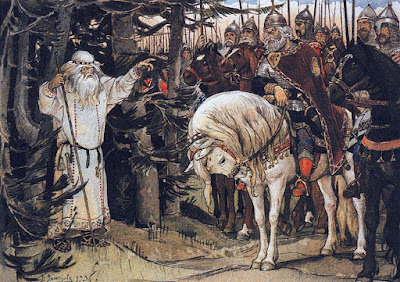 There are as many versions of these stories as well all across the Slavic world. They have a very boiled down version of these knights that can be used as PC class. I was very pleased to see this. So what does all of this material in the ' The Codex Slavorum' mean for the Amazing Adventures dungeon master? Well many of the monsters & elements have been transcribed & filtered into The Amazing Adventures Manual of Monsters. This isn't a slight on Jason Vey's work but when you want to have a party of adventurers meet the forces of the Slavic underworld head on. There's nothing like having the original source book in your hands to pull from in order to do it.Sure there's Wiki entries & internet what not but when you want your OSR source book to pull from when constructing then your going to want the ' The Codex Slavorum'. I've already gotten the question of 'how can an Amazing Adventures rpg demon hunter class & the vampire PC class coexist. The answer is simple. The vampire which was transcribed over to the Amazing Adventures Manual of Monsters & the demons of Slavic lore are all under the umbrella of the gods of darkness. There is more then enough darkness across the planes for an army of demon hunters & vampire slayers besides the two classes work extremely well together. For the pulp/super hero gamer who wants a Slavic slant on their character's origins this is a must buy. Raiders & the like who are looking for far deeper depth on the artifacts & treasure that their going after this is the book that can give your PC's deeper grounds. Five out of five for me because of easy of use, utility, & a solid no BS approach to the Slavic mythology & material .